On August 6th, 2015 officers responded to Egmont Street for a Breaking and Entering and Larceny from a building. The victim reported returning to her apartment to find the door open and the apartment ransacked. Officers observed pry marks along the frame of the door and the dead bolt lock torn off. This is the 7th burglary in the town last week. Many of these breaks the culprits forced their way into the apartments either through a window or door. This matter is still under investigation. On August 5th officers responded to Clinton Road for a report of a stolen bicycle. The victim reported that sometime between the 4th and the 5th someone entered there open garage and stole a bike. This matter is still under investigation. On August 5th an officer returned to his cruiser to find the windshield damaged. The officer reported the broken window. This matter is still under investigation. On August 5th officers responded to Egmont Street for a report of a larceny from a motor vehicle. The victim stated he parked his vehicle and returned to it the next day and found several items missing. This matter is still under investigation. On August 5th officers where on patrol on Mountfort Street, officers observed a vehicle traveling on this street and ran a random query of the vehicle, the query indicated the registered owner had a revoked license status. The officers pulled over the vehicle and identified the driver as the registered owner. The officers were able to place the individual under arrest without incident. On August 5th officers were on Thayer Street when they observed a school bus stop with its caution lights and stop sign. The officers then observed a vehicle travel passed the bus while the lights where still flashing. The officers pulled over the vehicle. After the driver produced his license and registration, a query of the driver’s information indicated that the driver had a warrant out for his arrest. The officers were able to arrest the individual without incident. On August 5th officers were dispatched to Harvard Street for a report of a Breaking and Entering. Officers spoke to the victims who stated upon arriving home they noticed the front door had sustained damage around the lock and door frame. They also stated noticing their bedrooms had been rummaged through. This matter is still under investigation. On August 4th officers were on patrol on Toxteth Street when a father reported his son hallucinating and he also had a screw driver in his possession. The officers were lead into the residence by the father and came into contact with the son. The officers detained the son. The officers searched the son for any weapons and anything the son may have tossed and came upon a brown substance which from their training the officers believed it to be heroin. After the father described what happened the officers decided to file a section 12 and transport the suspect to a local hospital for further evaluation. The suspect also has been summoned to court. On August 4th, officers responded to Egmont Street for a report of a stolen bike. Upon arrival officers talked with the victim who stated she secured her bike to a bicycle rack a couple days ago and noticed the bike missing yesterday. This matter is still under investigation. On August 3rd, an officer was dispatched to a parking lot on James St. for a report of a larceny of a motor vehicles tires and rims. On scene, the victim reported he parked his car for the night and the next morning he observed all four tires and rims were gone. The vehicle was placed on top of two liter soda containers. On August 3rd, an officer was dispatched to Bartlett Crescent for a report of a stolen bicycle. On scene, the victim reported the bicycle was left unsecured, resting against the rear of the house in the driveway. The next morning, the victim noticed the bicycle was missing from the driveway and immediately reported the bicycle was stolen. On August 3rd, officers assisted the Park & Open Space Department at the grand reopening of Warren Field at 133 Eliot Street. 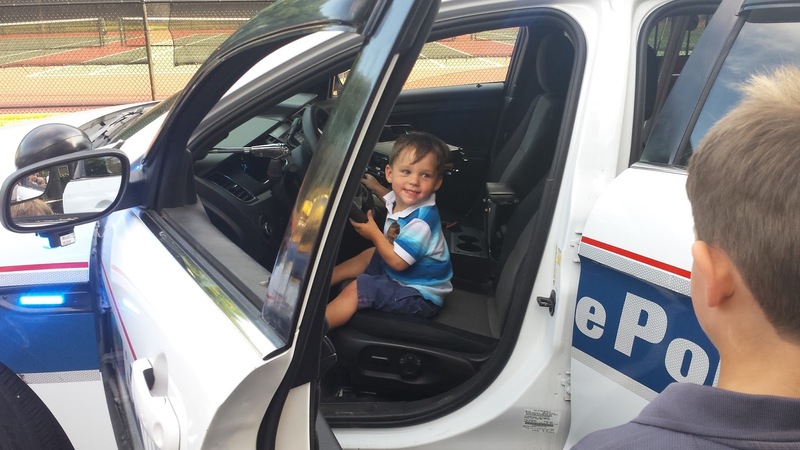 While on scene, officers gave young community members an opportunity to sit behind the wheel of a Brookline Police cruiser. One community member reported not being able to see over the steering wheel or touch the pedals. On July 29th, an officer communicated over the radio that he was involved in a motor vehicle pursuit. The officer indicated that the initial infraction occurred at the intersection of Washington Street and Cypress Street. The subject was riding a motorcycle and was traveling a high rate of speed. The pursuit ended on Huntington Avenue in Boston. The subject has been placed under arrest. On July 30th, officers were dispatched to a local business on Harvard St. for a shoplifter. The description of the subject was broadcasted over the radio by Brookline Police Dispatch. One of the officers noticed a man matching the description in a nearby parking lot. The officer stop the individual and advised the man of his rights. The officer proceeded to ask the subject if he had been shopping at the store which was recently shoplifted from. The individual stated he bought several items from the store, but was unable to produce a receipt. The individual gave consent for the officer to search his bag, which contained the reported stolen items. The subject was placed under arrest. On July 30th, while on patrol in the area of Coolidge Corner, an officer observed two suspicious individuals walking around and aggressively asking people money. The two individuals were stopped and advised as to the reason they were being stopped. One of the individuals did not have any active warrants and was sent on his way. The second subject had two active warrants and was placed under arrest. On July 31st, an officer traveling inbound on Commonwealth Ave. came to a stop at a red traffic light. The officer conducted a random query of the vehicle. The query revealed the vehicle did not have a valid inspection sticker. The officer activated his overhead blue lights in an attempt to pull the vehicle over. The vehicle pulled over to the shoulder, but continued to travel on the shoulder. The officer then signaled with the air horn and siren and the vehicle pulled over to the shoulder and stopped. The operator was advised as to the reason for the stop. The subject stated he did not initially stop for officer because he did not have a valid driver’s license. Brookline Dispatch confirmed he did not have a valid license and was placed under arrest. On August 1st, an officer was dispatched to the area of Boylston St. and Clarke Rd. for a report of an individual breathing but slumped over in the driver’s seat of a vehicle. The reporting person stated the vehicle was stopped but was still running. On scene, the officer noticed the vehicle was still in drive so he placed the vehicle in park and turned the vehicle off. The man awoke shortly after the officer turned the vehicle off. The officer then called for the Brookline Fire Department and EMS to evaluate the man for any medical conditions. The EMT’s concluded the man had no medical issues and left the scene. The officer observed a hypodermic needle lying on the floor board in the front of the center console. The officer ordered the subject out of the vehicle and began searching the vehicle. The search revealed several used syringes and one syringe filled with a cloudy liquid substance. The subject was placed under arrest. On August 2nd, an officer traveling northbound on St. Paul Street observed a vehicle make a wrong turn onto a mark One-Way road. The officer activated his emergencies overhead blue lights to initiate a safe traffic stop. The officer then advised the driver as to the reason for the stop. The officer then checked the status of the individual’s driver’s license, which revealed his license was suspended. The subject has been placed under arrest. On August 2nd, an officer was dispatched to Marshall St. for a report of a past breaking and entering of a motor vehicle. On scene, the victim reported his back windshield shatter and the contents of his in disarray. The victim reported missing a small sum of loose change.